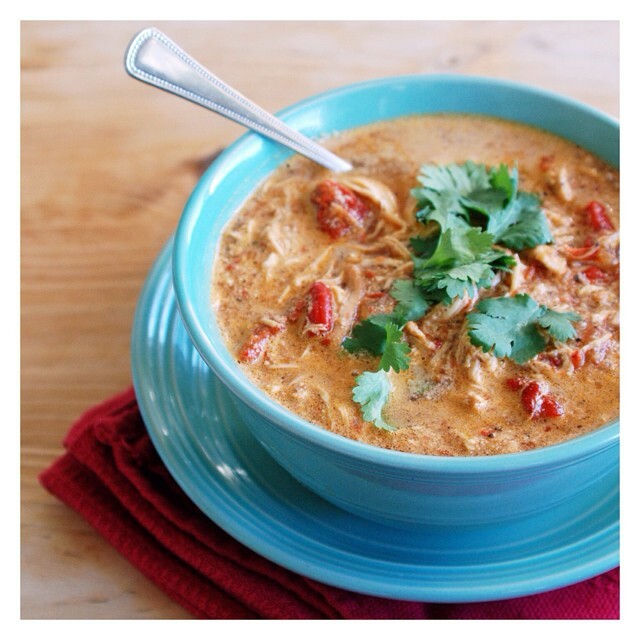 Put tomatoes, red peppers and chicken in a crock pot. Note: I ran my tomatoes through a blender first, I have tomato haters in my house and this is how I disguise them! Shhh…don't tell @justinbrande! Melt butter in a sauce pan, add flour and stir to create a paste. Stir in chicken broth and 1/2 C of coconut milk, bring to a boil. Remove pan from heat and stir in the rest of the coconut milk and add seasonings to your taste. For the cacao I used @criobru Maya flavor. Adding more chipotle will make the dish spicier. Pour this mixture into the crockpot and cook on low for at least 6 hours. You can cook for a few more hours if you need to leave for work, the meat will only get more tender. Depending on how fatty the chicken is, and the brand of coconut milk you use there might be a fat layer on top of the soup, remove this layer with a spoon. Shred the chicken while in the pot. Serve with toppings such as fresh cilantro, fresh diced tomatoes or avocado.